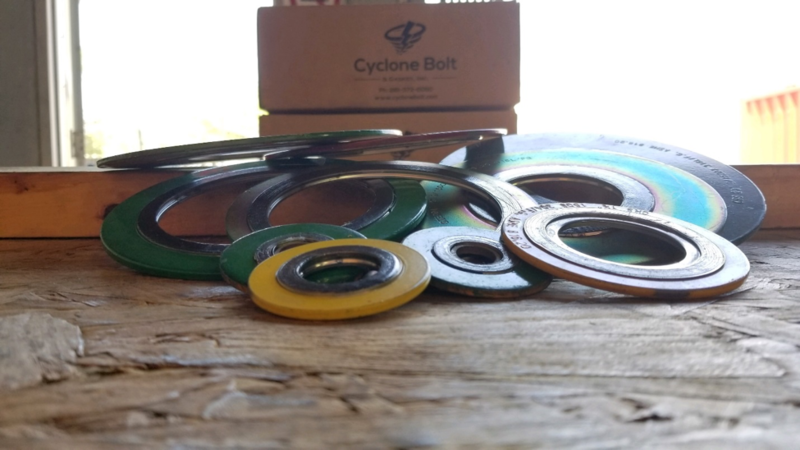 Cyclone Bolt and Gasket stocks spiral wound gaskets and can ship in less than 24 hours. Cyclone’s spiral wound gaskets are most commonly stocked in 304 & 316 stainless steel, along with some special alloys. Sizes range between 1/4” to 36″, and a summary of our product line of spiral wound gaskets can be seen below. The material for Spiral Wound Gaskets is identified by the colors on the outer edge of the gasket. 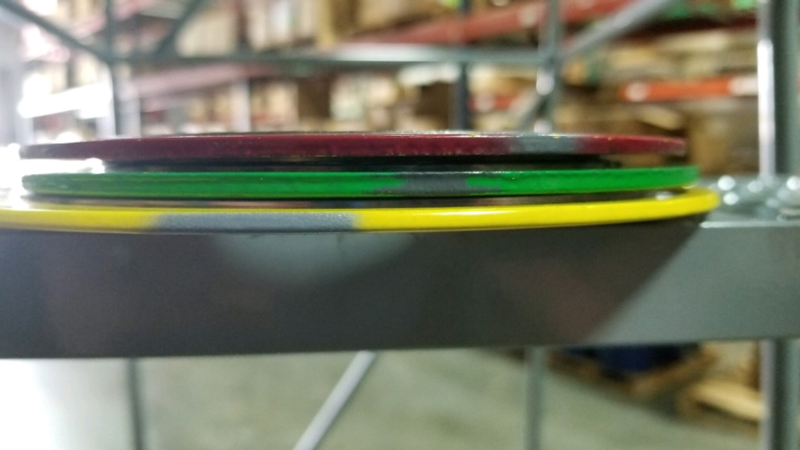 The windings material is identified by the color of the spiral wound gasket’s entire outer edge, and filler material is indicated by the color of the stripes along the outer edge. 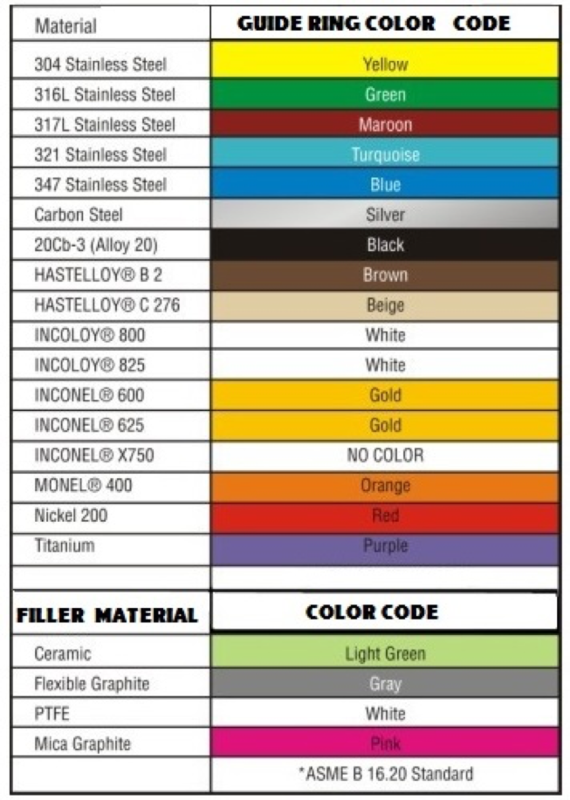 The Color chart below shows the different colors that correspond to the different materials and filler materials for Spiral Wound Gaskets. Large diameter spiral wound gaskets (above NPS 24″) are available in either Series A or Series B, which are competing specifications. Series A spiral wound gaskets are more commonly used and can withstand more external pressure, while Series B spiral wound gaskets are typically found in non-critical applications. For both Series A and Series B spiral wound gaskets, the dimensions are different and must match the flanges they are being used to seal. The class of spiral wound gaskets corresponds to the flange pressure classes they are used with. Spiral wound gaskets are available in 150, 300, 600, 900, 1500, and 2500 pressure classes. The windings density of spiral wound gaskets depends on the class of the gasket. Low-pressure spiral wound gaskets, such as 150 class, are made with a low number of windings per inch. Higher pressure applications, greater than 150 class, require a more resilient design and a higher number of windings per inch. The inner ring available for spiral wound gaskets is used to prevent spooling. Spooling is the uncoiling of the windings of the gasket, which is unfavorable in any application. Spooling of spiral wound gaskets can be caused by pressure applied during bolting as well as pigging (cleaning) a pipeline.